Imagine fusing Morrissey and Marr's Smiths debut album era brains together and transporting them forward thirty years to the digital age. 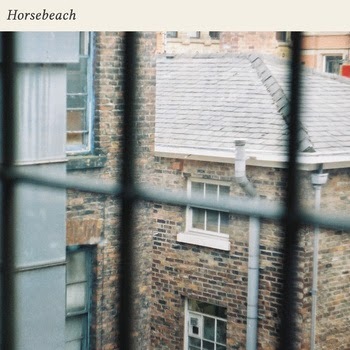 We reckon that it'd sound pretty much like Horsebeach, a truly gripping, beautifully melodic debut album recorded straight to tape in a flat in central Manchester. Horsebeach is the brainchild of Ryan Kennedy. In a world where bands are trying to embrace technology and use it to their benefit, it's refreshing to hear a record that unashamedly harks back to the past, steadfastly proud of what it is. If you're a lover of C86 jangly guitars, early Teenage Fan Club, The Wake et al, you'll adore this record as variations on that simple theme course throughout the forty minutes or so of the album. The album features two tracks from their (also) self-titled debut EP that came out at the back end of last year and both tracks from their Faded Eyes 7" as well as six new songs. Like all great albums, there isn't an immediate stand-out track and neither is there one or two that let the side down either. It flows as a whole, a sign that despite its humble origins, it's also been painstakingly created and put together to work in that way. Lyrically the record is quite simple, but as with so many great Mancunian lyricists such as Bramwell and Morrissey, simple doesn't prevent songs from being drenched in evocative world-weary romanticism such as on Cold Hands - "If we could find some more time, I'd still waste it right here with you" and the misty-eyed romanticism on Dull - "And if they knew, well I don't care because when I'm with you, a day will never be dull again. Never be dull again until I'm alone again"
Horsebeach is a record that appears to have been made out of the love of making music at home on your own rather than something for mass consumption. Ironically, that fact makes it eminently listenable, a record you can listen to over and over again without getting bored of it. The album is available from Horsebeach's bandcamp page in digital, CD and vinyl format and from all good record stores including Piccadilly Records who recommended it to us (we think Ryan works in there). They play a launch gig on Friday night (August 1st) at Manchester's Soup Kitchen. Horsebeach are on Facebook and Twitter.